went to be with the Lord on Sunday, November 18, 2018 at St. Andrew's Village, Indiana, PA. She was born September 1, 1925 Livermore, PA​, the daughter of the late Clark Campbell​ and Emma Campbell​. Louella was the last remaining member of her Campbell family. 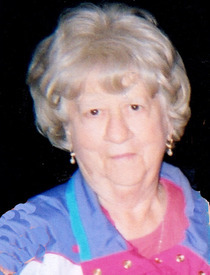 She was an avid church goer of Christ Bible Fellowship of Indiana, PA. She had worked and retired from Torrance State Hospital as a nurse for 25 years. She was a lover of music, having played the piano first and then moved on to the organ and finally learning the accordian. Louella was always moving, either keeping her house emmaculate or going uptown to shop and talk with friends. Many times her daughter and her would go on rides up past her childhood homestead and farm. Along with all of this, she was an avid dog lover and walked her dog Butchie as much as possible out to the lake and back.​ She is survived by her daughter, Viola Wadding & husband, Harry of Blairsville, PA​; son, Louis Stipcak & wife, Ateena, Marshall Heights, PA​; grandchildren: Jason, Kevin, Tim, Brenda & Valerie; 14 Great Grandchildren​ and also several Nieces & Nephews​. She was preceded in death by her husband, Andrew M. Stipcak in 1981​; granddaughter, Tammy Wadding Plopi in 2017​; sisters: Edna, Ida & Marie; brothers: Clark & Warren ​ and also her dog, Butchie​. The family will receive friends at the James F. Ferguson Funeral Home, Inc., Blairsville, PA on Tuesday, November 20, 2018 from 2-4 & 6-8 PM. ​A funeral service will be held at the James F. Ferguson Funeral Home, Inc., Blairsville, PA on Wednesday, November 21, 2018 at 1:00 PM. Pastor Lorraine Henry will officiate. Interment will be in the Blairsville Cemetery, Blairsville, PA. If so desired, memorial donations may be made to Four Footed Friends, 220 Beck Road, Indiana, PA 15701​.